I remember first learning about Día de los Muertos in high school Spanish class. We created an alter for our dead loved ones, made paper skulls and enjoyed food. I thought it was interesting how colorful and happy the celebration was. The celebration is much different then most funerals in the United States. Now Día de los Muertos is huge and skulls are everywhere. Most of the time when you see a calavera (sugar skull) they're very colorful - which I love. I made these colorful skulls a few years back. This year I wanted to do something different. The inspiration for these cookies came from fancy sugar skull wrapping paper from Paper Source. 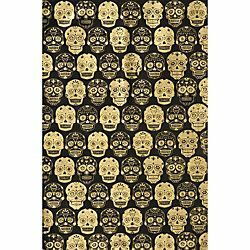 I loved the look of the sugar skulls in black and gold. I used this set of skull cookie cutters. The cookie cutter can be flipped over to stamp the skull design into the unbaked cookie dough. I piped and flooded the cookies with a yellow icing. Once the icing was dry, I used gold fondant glaze. I've seen this glaze used on a few other cookie blogs, and wanted to give it a try. I painted it on with a paint brush. Make sure to shake it up really well. I made the mistake of not mixing it enough and had to apply additional coats. I was happy with the gold color. I didn't eat the cookies so I'm not sure how they tasted. I let the glaze dry over night. The next day I piped on the black faces.